Food Allergies have always been a source of my shyness. I don’t consider myself to be a shy person at all, really. Truthfully, I can walk up to any person and strike up a conversation. Sometimes, I get a pit in my stomach about approaching people, but only sometimes. But with my allergies, it’s a completely different experience. I can’t really pin point an exact reason why- there must have been some experience that triggered it, I just can’t really give one situation that started it all. Maybe it’s because I don’t like people to pity me or feel bad for me. Whenever I say I have food allergies, people immediately say, “Oh I’m so sorry! How can you live without ice cream?” I usually respond by saying, “Well there’s a lot of amazing alternatives and I’ve never been able to eat it so I don’t really miss it.” The fact that people say they are sorry for me really bothers me for some reason. Yes, it’s unfortunate that my body seems to think that peanuts are some sort of plague that will kill me, but it doesn’t bother me. I’m ok! I think it’s also because I don’t want people to feel bad about not being able to offer me food. The other day I was at a friend’s party and her mom asked me if I wanted pizza, to which I responded, “No that’s ok, I’m having a family dinner after this, but thank you anyways.” I was not having a family dinner. I was okay with not being able to eat the pizza, but I literally told a bold faced lie just so I wouldn’t get someone asking me what else they could make me because they felt bad about not being able to provide me with something safe. This might be an unpopular opinion, and so be it. But as a teenager, there’s something about people trying to pity you that isn’t fun. If it was literally anything else, I think I would be okay. But pity over food seems a bit ridiculous to me. I guess that’s why I’ve decided that this year, I’m really going to try to overcome that shyness. I’ve realized that food allergies are nothing to be afraid of, and if someone like a waitress wants to be annoyed that they have to take extra time to write down “allergic to dairy, peanuts, tree nuts, and sesame seeds”, then let them be annoyed. Or, just say, “You know what, never mind. I’m not going to eat somewhere that is upset about the fact that I could die by ingesting just a small amount of something that my body considers to be toxic.” Then, I would proceed to throw down some money for a tip and drinks and walk out. That would be cool, I think. Maybe overdramatic, but that’s kind of my personality… haha. But really, it’s dumb for me to feel timid about telling someone about a condition that I can’t control, so I’m going to work on it. Sorry for yet another year-long absence, I promised that it wouldn’t be the case, but clearly I am a liar… haha. I’m working on it. Anyways, follow my social media for my most up to date content. Let’s be friends on Instagram or Twitter or something :). Thank you for reading, have a fabulous day, and let me know in the comments below if you ever feel this sort of insecurity around food allergies and what your experience with it is! Please pardon my absence. I could make 1,000 excuses as to why I haven’t posted in almost a year but quite frankly, I’m not sure any of them are good enough. Anyways, I’m back and full of new ideas. When I started this blog, I wanted it to be a food blog. I guess that’s because I always thought that food was the only challenge surrounding food allergies.While that is a huge challenge, I’ve come to realize that is not the only challenge. As a sophomore in high school, I now know that there are social challenges that come with food allergies, among many others. Now, I’m not saying you will never see another recipe from me, I still love to cook and prep my meals. I am saying that I think I want to post more about my opinions relating to issues and challenges and the ways I solve them. I also want to post stories and articles I found interesting so we can have a conversation about it via social media or the comments in my posts. Most importantly, I want to try to do my best to make this more of a community than a blog. I have an Instagram, which is @sweetbedlam, and I have a Pinterest, which is @sweebedlam, but I think I should make a Twitter and a Facebook so we can connect all over the web! So, until next time, which I promise won’t be a year from now, let me know what kinds of things you would like to see. If you’re someone who has food allergies, what kind of challenges do you face in your everyday life? How do you deal with them? Let’s start a conversation in the comments!! Fall is one of my favorite seasons for cooking. You can finally use those apples you’ve been eye-balling at the grocery store and those cans of pumpkin that have been sitting in the back of your pantry for a year (hopefully they haven’t expired yet!). You can be sure that you will be seeing a lot of pumpkin and fall themed recipes for the next few months! Today, I’m starting out with a bang (hopefully)! This moist, luscious muffin does not have any dairy or nuts in the original recipe which means there is no substitutions necessary. This recipe is an adaption from a recipe from The Joy of Cooking‘s Applesauce gingerbread cake. That very cake was the cake my aunt made for me on my first birthday and we have been eating it as a family ever since for many occasions. 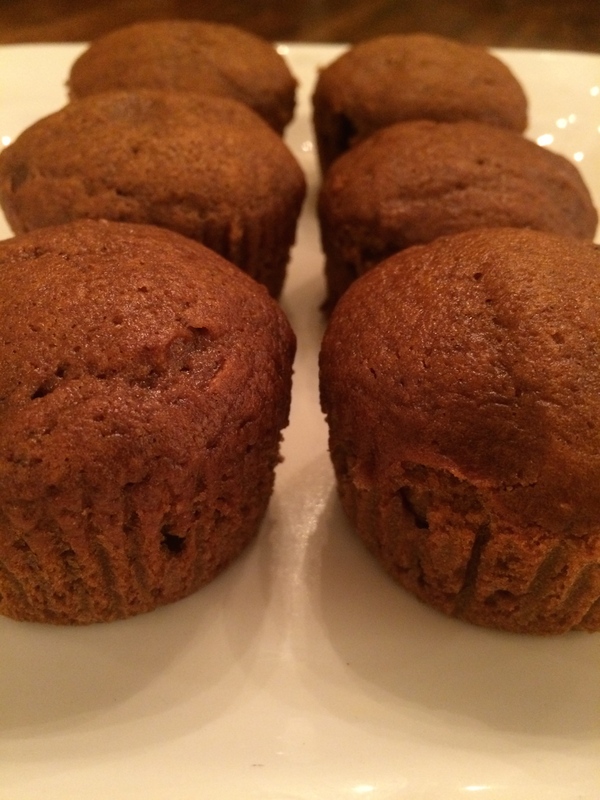 You can frost these and make them cupcakes or you can keep them unfrosted and have them be muffins so they are very versatile. Make sure you try both and compare the two… I personally cannot pick a favorite but there sides of both that you are sure to love! Preheat oven to 325ºF and line muffin pans with muffin tins. Put pumpkin, molasses, and baking soda in a saucepan and heat over medium low heat until they are combined and the molasses starts to thin. In a medium bowl, sift flour, ginger, cinnamon, and cloves together. Add the salt and stir until combined. In a large bowl, beat the eggs and the sugar at a medium speed until thick and the mixture has a pale yellow color (somewhere between 3 and 4 minutes). Then, beat in the pumpkin mixture and the flour mixture at a low speed, beginning and ending with the pumpkin mixture. Beat just until combined. Bake in the preheated oven for about 20 minutes for muffins (mine was done at about 23 minutes but check them after 20). Enjoy! Make sure to leave a comment about what you thought about them! Also, let me know if there are any other recipes you would like to see!! Thanks for reading! Today I had a busy day in the kitchen. I heated up a frozen “Fire Roasted Pizza” from Daiya, made a zucchini pineapple bread (recipe will be up later this week! ), and this recipe that I have been dreaming about for a really long time. 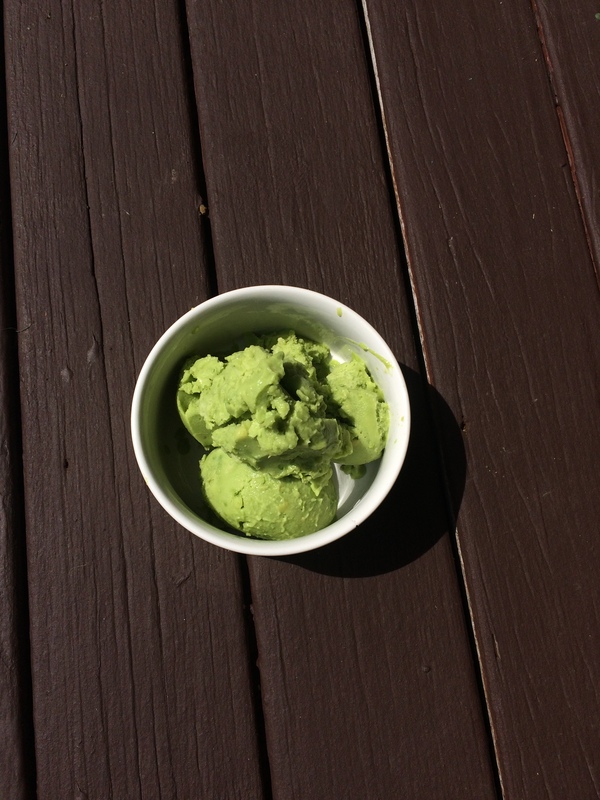 A few weeks ago, I got the idea for an avocado based ice cream. I was thinking and I realized that with avocados, the ice cream would be free of many allergens like nuts, soy, and dairy. There would no need for almond milk creamer, coconut milk creamer, cashew milk creamer, soy milk creamer, or heavy cream. Although this recipe tastes exactly like avocado, I think there’s lots of room for creativity. Pineapple avocado ice cream anyone?? Let me know what you think about this recipe. 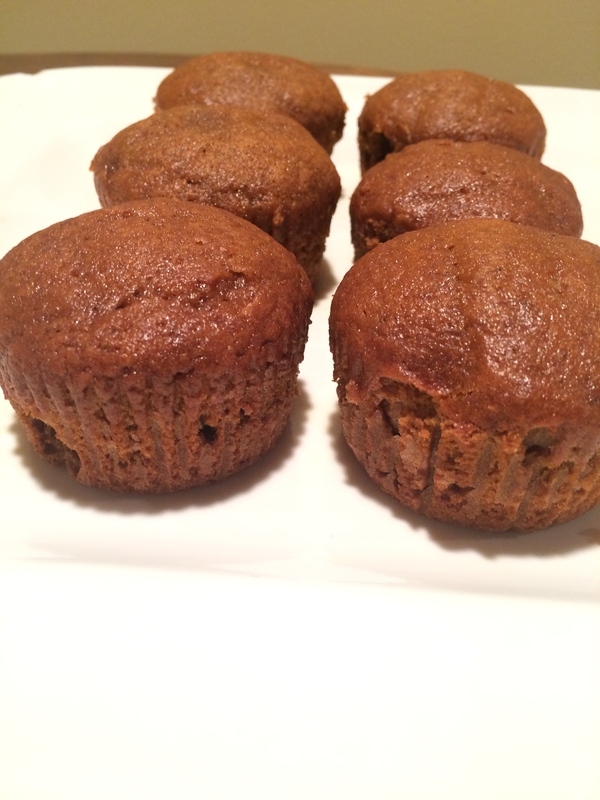 I think it tastes good, but I want your feedback, more so than on any other recipe! 1. Cut and puree the avocado until it has a guacamole like texture, maybe a bit smoother. 2. Put the avocado puree in a bowl and add all of the other ingredients. Stir them together until well combined. 3. Pour the mixture into your ice cream maker and start the ice cream maker according to manufacturer directions. Once it has reached your desired consistency, serve it immediately or put into your freezer. If it is too soft, you can put in your freezer and it will firm up. Today, I decided to get creative. I thought a lot about what I wanted my next recipe on my blog to be. It’s too hot to bake right now so I needed something refreshing, something inventive. That’s where this recipe came in. I love making ice cream. There’s something about the sound of the ice cream maker and the taste of something you make from scratch that makes the ice cream so much better. Not to mention this ice cream has an amazing undertone of coconut combined with sweet vanilla and crunchy chocolate chips. What’s better than that? Oh yeah, the fact that it is gluten free, dairy free, and egg free! For the cookie dough: Combine the first three ingredients in a small bowl. In a medium bowl, beat the sugars and the butter together until fluffy. Add the vanilla and blend. Add the dry ingredients to the mixture and blend until you read a cookie dough consistency (about two minutes). Roll cookie dough into small, round shapes and freeze until firm (about half an hour). For the ice cream: Whisk together all of the ingredients and put into a frozen ice cream maker base and begin to make the ice cream according to the manufacturer’s directions. Once the ice cream begins to get slightly firm, add the cookie dough balls into the ice cream maker. I recommend either keeping the cookie dough in their round form or breaking them into 1/2 their size or into a few small pieces, depending on how much cookie dough you want in each bite! For a soft serve consistency, serve directly from ice cream maker. 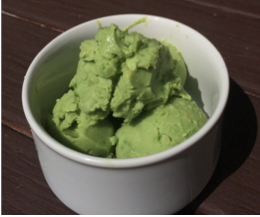 From a firmer texture, freeze the ice cream for a few hours or overnight and enjoy! Today, I have one of my most favorite recipes EVER!!!!! Love is not a strong enough word to describe my feeling towards avocados. I put them in my salad, on my sandwiches, and in this recipe. This recipe is so easy and is free of dairy, tree-nuts, peanuts, sesame seeds, gluten, and eggs! It is a great appetizer when served with tortilla chips or vegetables and could even be after-school snack! 3. Serve with tortilla chips or fresh vegetables. My name is Carlin and if you haven’t already read my about page, you wouldn’t know that I am the face behind “Sweet Bedlam”. I am very excited to share some of my food allergy experiences with you as well as to share recipes for eating safely with allergies. In an effort to be more than a person behind a screen, I wanted to give you a little introduction about myself. So, I am 14 years old and will be a freshman in high school in the 2015-2016 school year. I live with my mom, my dad, and my younger sister. I play competitive soccer as a forward and have been playing since I was 5. My favorite things to do outside of school and soccer are cooking, hanging out with friends, and shopping. That was a small introduction but don’t worry, I can guarantee that you will learn more about me in my future posts. I am so excited to be able to share some tips and information about food allergies with you and I can’t wait for you to see what I have in store for this blog!! That’s all for now. Make sure to check out my contact page for ways to keep in touch with what’s going on with the blog!! Want to follow my blog? Click here to enter your email and receive a notification when I upload!